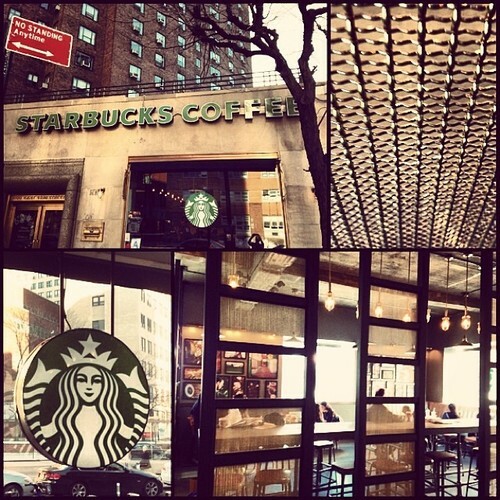 I really was not expecting to find very many great Starbucks left in Manhattan this close to the year’s end. Yet, here I sit at the beautifully designed Starbucks on the border of Stuyvesant Town and Kips Bay. This Starbucks can’t be more than a few weeks old, and its size, design, decor, seating and overall newness really do make for a perfect Starbucks in the city. My favorite attribute has to be the chain screen panels that separate the seating area from the hall and the bar. But other great features include the hanging lighting, the wood paneled walls and the hanging pictures. And the closest thing to a flaw this Starbucks has is its location. This area on 1st ave is at least 10 blocks from everything and a long walk to public transportation that’s not a bus. Fortunately there is a Citi Bike just out front. How do you think I got here? Sometimes I need to remind myself that when I conceived the idea for this blog, I didn’t imagine a relentless race through the 200+ Starbucks of Manhattan just to say “I did it!”. The reason I am doing this is so that I can explore this daunting and monstrous island through a familiar setting. If I take a train to a Starbucks in an yet-to-be discovered neighborhood, walk directly into the place and leave 30 minutes to an hour later… what did I discover? I’m in one of the most unique neighborhoods in Manhattan — if you can even call it a neighborhood. 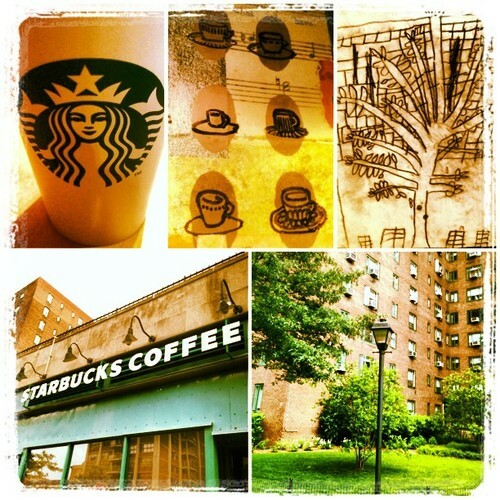 I sit at a Starbucks on the border of Stuyvesant Town, aka Stuytown. This neighborhood is actually a giant private housing community that spans from 14th – 20th street on the east side and holds over 8000 apartment units. It’s privacy is debatable though, considering I was free to roam around at my own leisure. Nevertheless — it’s beautiful, and full of large trees and fenced off grass. Just above Stuytown is Peter Cooper Village, which is basically a continuation of the development, consisting of the same architecture and greenery. Taking a few moments to walk through this neighborhood (even as rain threatened overhead) gave me a pinch more of appreciation of the diversity that NYC offers. And those Stuytown residents are very fortunate to have an excellent Starbucks on the border of their neighborhood. The Starbucks on the corner of 17th and 1st is both spacious and unique. Hanging on one wall (and pictured above) are spring themed drawings from the 2nd grade students at PS 40. I love seeing such a local presence in a huge corporation like Starbucks. Other features include a long comfy bench (polka-dotted, in fact), window seating, a code-access restroom (sorry passers-by), and an expansive wall mural consisting of coffee cups, a guitar, a globe, and other randomness.